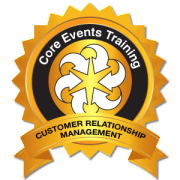 Core Events Accreditation for Customer Relationship Management is a very interactive training and development program focusing on proven techniques that guarantee to teach you, or your staff, how to win over customers and secure them for life. A positive customer experience is the most important aspect of any business, whether that be in Retail, Resturant, Banking, Insurance, Technology and the list goes on. If you or anyone in your organization have one-one contact with customers or potential customers, then you don’t want to miss this training! All training can be adapted to meet the unique needs of your customers.